Although the emphasis is on the defenses, the group therapist by no means avoids the expression of profound irrational infantile feelings. Quite to the contrary, he actively interprets resistance for the very purpose of releasing them. The group members help him accomplish this goal. For although as individuals they tend to become defensive when they are approaching the warded-off feelings, as a group they become irritated with defensiveness in others and pressure one another to be more open and direct in expressing them. When a member does break through his defenses, the group becomes warmly supportive. Moreover, there is no psychosexual level to which their feelings cannot revert. Groups can be exceptionally stimulating to the recreation of preoedipal as well as oedipal feelings. 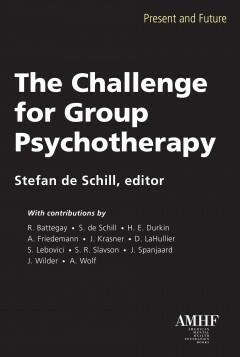 A number of authors, including Grotjahn, Fried, Glatzer, and myself, have made a special study of the fate of preoedipal conflicts in group psychotherapy. For example, Glatzer (1962) reported that in her experience the group is extremely helpful in penetrating the tenacious primitive defenses which characterize orally regressed patients. She feels that both the therapist and the patients are more active in making interpretations than is the individual therapist and that this is essential for such basically passive individuals. My own experience unquestionably confirms these findings. Once the resistance has been dealt with, the infantile libidinal or aggressive feelings that have been pent up flow out freely and everyone participates to some degree and in his own way in a common regression. For the individual it may become very intense. The group, therefore, is punctuated by periods of profound emotion, but, on the whole, such periods do not last long. One or another member interrupts them either because he cannot tolerate too much primitive emotion or because he has been stimulated to express his own needs. In analytic group psychotherapy, such intense though brief periods of regression can be shown to bring about changes in the mental structure, provided they are skillfully interpreted and assiduously worked through. Small quantities of increasingly strong emotion are released in the repeated encounters with various group members. Their intensity seems to be cumulative, and it is magnified by the total group’s involvement. They become therapeutically very powerful. As the analysis of transference and resistance continues, interaction and insight go hand in hand. The members continue to explore their current behavior in the light of early familial experience until the vestiges of the past no longer so flagrantly intrude into contemporary relationships. Realistic relationships with members of the group and the therapist, and also with relatives, friends, and colleagues in the outside world, gradually come to predominate over transference. Both Slavson and Foulkes were originally of the opinion that the group situation was not well suited to working through transference neurosis, but both have come to the conclusion that it can be done. Slavson feels that the resolution of transference neurosis is of secondary importance as a therapeutic instrument in group psychotherapy. Foulkes (1964) writes that after twenty years of experience he has come to the conclusion that individual transference neurosis can be recognized in the group and therefore analyzed; but he adds that it does not develop in pure form and cannot be worked through in the same detail. Schwartz and Wolf (1962) are convinced that it can be done very successfully if the therapist uses his interventions to encourage it and to deal with it. Dreams, they point out, are very useful in this respect. Hulse, in a private communication, voiced the opinion that if the therapist views the member-to-member transferences as being displacements from those to the therapist, then the transference neuroses of the individual members can be perceived and analyzed. Our question is also baffling because the concept has been ambiguous enough to invite a variety of interpretations. Two requirements of transference neurosis are unequivocal. The past must be restored in the treatment situation and the patient must experience his distortions as “real and actual” (Freud, 1914). But ambiguity arises from the lack of specificity as to the degree and duration of the regressive experience. Consequently, some authors who continue to be influenced by the early psychoanalytic focus on the id and have confidence in the therapeutic value of the catharsis put a premium on prolonged “deep” regression. Those who have moved toward the more modern view that only the ego can be influenced therapeutically (Fenichel, 1941), and who therefore tend to stress the analysis of the ego defenses, take a different stand. For them the past must indeed be restored; but pervasive and prolonged regression, though welcome if needed, is not indispensable. Analytic group psychotherapy, as I see it, adheres to the latter point of view; from that standpoint it may be argued that transference neurosis does take place and may be analyzed in the group situation. All transference behavior is drawn into the treatment situation and is experienced by the group members as “real and actual” (Freud, 1914). Moreover, the regressive experiences are “deep” both in the sense that they are intense and in the sense that they reach back into every epigenetic level. However, the experience has unique characteristics in therapy groups. The past is lived out not only with the therapist but with the group members, all of whom are to be included in the treatment situation. Secondly, because reality persists, the periods of regression are relatively discontinuous. For instance, one or more of the members may be deeply involved in repeating the past at any given time, but there are usually others who are not as much involved, who recognize the distortions, and who are not loath to point them out. They also support the group therapist in his translation of the transference behavior into the terms of the past. Thus, intermittent periods of regression and insight into reality occur in more rapid succession than in individual psychoanalysis. Viewing the movement of the group as a whole, one observes that interconnecting and constantly restructured transference processes are always present and are repeatedly being interpreted, until the major aspects of each member’s transferences have been systematically experienced and worked through. In this expanded sense, the qualifications of the transference neurosis and its resolution are met. However, because the experience in the group is not identical with that of individual psychoanalysis, it would be more precise to speak of a group equivalent of transference neurosis. Both the perplexing theoretical problem of the transference neurosis and the broader question of whether analytic group psychotherapy qualifies as a bona fide form of psychoanalytic method can, in my judgment, be resolved if we regard them in the light of the changes that have taken place in the expanding field of psychoanalysis. The cultural schools have come to view the therapist as more of a real person who also plays a more active role in treatment (Ackerman, 1954). Social experience beyond that of the family, such as is offered by the group situation, is being given increasing acknowledgement by the interpersonal schools. These ideas have not been accepted by classical analysis, but they have not been without influence upon it. Group psychotherapy, because of its unavoidable tie with reality, is forced to effect these changes. But of far greater significance for analytic group psychotherapy has been the development of psychoanalytic ego psychology, which put an entirely new complexion upon the role of the ego in the structure of the personality. From having been considered “a baby riding astride an elephant” the ego has come to be recognized as the synthesizer of human experience. It followed that the ego became the major target of analytic interpretation. Anna Freud (1936), spokesman for psychoanalytic ego psychology, accordingly expanded the definition of transference to include not only the infantile libidinal and aggressive drives but the transference of defense as well. Clearly, one may therefore speak of defensive regression also—for the past is restored indirectly through the defenses as well as directly through the reenactment of the drives upon which they feed but serve to ward off. These conceptual developments provide theoretical accommodation to the group-determined adaptations of classical analytic method into the framework of psychoanalysis proper. Analytic group psychotherapy thus emerges in principle as a legitimate form of psychoanalytic treatment. Experience with analytic psychotherapy groups has, in general, confirmed for me the tremendous viability of the basic principles of psychoanalysis. Its practice has suggested that certain tactical modifications necessary to the group might be profitably employed in individual treatment as well. This was put to the test in the early experiments with combined group and individual treatment. The indications were positive. For example, neither the therapist’s greater exposure of his human frailties nor the piecemeal analysis of the patients’ transferences in the group interfered with the development of the transference neurosis in his individual sessions or in its analysis (Sager, 1960; 1964). Moreover, the less-guarded attitude which had increased the group therapist’s spontaneity seemed also to give the individual analyst more leeway for creative therapeutic activity. Since then we have been using these techniques in individual analysis except where contraindicated. It must of course be kept in mind that this somewhat increased freedom does not relieve the therapist from the task of keeping his spontaneity within the bounds of his analytic neutrality. His personal emotions, experiences, and fantasies have no place in either group or individual psychoanalysis. Under the changed conditions, the therapist becomes more acutely aware of his counter-transferences and is less likely to avoid or repress them. Nevertheless, he must continue to wrestle with them himself and avoid burdening the patient with them. (Who needs it?) His emergence as a real person concerns only his “way of being.” Otherwise, it is reserved for special situations, such as responding in a human way to illness or death in the patient’s family or his own. From my own reading of Freud, Fenichel, Glover, and others, I judge these attitudes to be in the spirit of the original psychoanalytic technique, though not always according to the letter of present-day teaching. The same less rigid attitude seems to give the patient a better opportunity to develop that “real relationship” with the analyst (Greenson, 1967), which reduces the patient’s sense of isolation and brings his analytic sessions into closer connection with his life outside. These are valuable contributions. There are salutary effects, too, when the therapist applies his now more active approach with his individual patients. He decreases his chances of waiting too long for the patient, who is after all warding them off, to become aware of his infantile wishes on his own. The therapist becomes more acutely attuned to resistance and he is quicker to take the first step in directing the patient’s attention to what is going on in their relationship. His habit of paying strict attention to what the patient is “doing with” his communications stands him in good stead. The shift of emphasis toward process from content seems to bring about a closer relationship between insight and change of behavior. Furthermore, increased emphasis on character resistance helps to dig down into the roots of the mental structure and facilitates change in it. In my experience, analytic group psychotherapy has proved to be a sound and reasonably effective method of treating neurotic, character problems, and many borderline patients. As our knowledge and experience increase, it should become a progressively effective form of psychotherapy, provided we are not hesitant about adapting its basic principles to the needs of the patient population. Psychoanalytic method is more flexible than has yet been realized. For the present, analytic group therapy seems to have fallen heir to the current disenchantment with psychoanalysts. The hope that psychoanalysis would be a panacea is gone. Those who unconsciously expected too much of it have been disappointed. Like disappointed children, they became angry with the parent whose human limitations have been discovered. Many of these critics turned away altogether from psychoanalysis and sacrificed its productive concepts and techniques, as well as those that need to be changed or discarded. There are also more realistic reasons for the disenchantment. Many gaps in our knowledge need to be filled and many hypotheses must still be tested, revised, or rejected. Certainly, these limitations are not insuperable. The fact that psychoanalysis as a body of knowledge is very difficult to learn accounts for some defections. As a method of treatment it demands much from its practitioners, not the least of which is the ability to work in a harmonious balance of emotion and reason, activity and inactivity. Moreover, like most great contributions to the world’s thought (Christianity and Marxism are examples), psychoanalysis has become somewhat self-alienated at the very hands of those who sought to perfect it. Some zealous practitioners became so engrossed with the letter of the law that they lost sight of its spirit. They became ever more knowledgeable, but also ever more rigid. Analysis of content became increasingly exact, often at the expense of the all-important human element. The relationship between therapist and patient, within which alone the therapeutic process becomes effective, was neglected. Interpretations tended to become intellectual and mechanical in the hands of such analysts. Yet with others they tend to become loose to the point of meaninglessness. Many of its present critics blame the conceptual system and its method for these shortcomings instead of aiming their disapproval at its misuses. We know from the psychology of compulsion neurosis that there can be a flight from the vividness of the world of instinct into the shadow world of words and concepts. . . . We are familiar, too, with a flight in the opposite direction—away from unpleasant knowledge into the dark twilight of vague intuition alien to intellect. . . . In a therapeutic method based on science, both these types of flight have no place. . . . There are experienced analysts who are subject to the same mistakes. . . . A constant and important task of the analyst is to steer a course between the Scylla of talking instead of experiencing, and the Charybdis of unsystematic free floating that corresponds to the acting out of the patient [pp. 4-6]. Continual reciprocal interaction between emotion and intellect, between insight and experiencing (interaction in a group), is pejorative. But the discontent with psychoanalysis has also had definite constructive results. New approaches have been suggested and tried out which should be studied with an open but critical mind. It is not necessary to be so devoted to psychoanalysis that we rule out innovations categorically, nor so enthusiastic about innovations that we throw out the proved principle and practices it has provided. There is every reason to try to integrate them into analytic group psychotherapy or to utilize them in combination with it whenever indicated. Most of the recent innovations have been concerned with breaking away from an intellectual approach and reaching through to more primitive feelings. This is partly due to a tendency to confuse the desirable application of intelligence with the defense of intellectualization. But there is also a need to find a way of breaking through very rigid defenses in outpatients. Intensive “workshops,” marathons, retreats, and the like have this goal in mind. The same is true of the gestalt techniques for achieving greater inner awareness, especially body awareness. Followers of Wilhelm Reich are attempting the same thing by a combination of body manipulation and analysis. These methods are effective up to a point. The repressed primitive emotions do break through, but we must point out some caveats. The current fervor for experiencing has an air of mysticism about it that suggests Fenichel’s “dark twilight of intuition.” The experiences provide excitement and they are invigorating, but unless the emotional “freedom” and insight gained are worked through in terms of the patients’ infantile conflicts, there can be no lasting effect—no basic change in the mental apparatus. For this reason, patients who have these experiences should participate in analytic groups or individual treatment concurrently in order to work through their learnings. Another caveat: There is a close connection between the new freedom and “acting out,” which is often consequent upon intensive group experience. The acting out provides blessed relief from anxiety but it prevents these individuals from working out their infantile conflicts. Therefore the neurotic behavior is in danger of being preserved. A third pitfall lies in the fact that these intense experiences stir in patients the hope of achieving that perfect union for which they have longed (the restoration of primary narcissism) and of having their fantasies of omnipotence come true. It is a false hope; only too often it perpetuates the neuroses, for patients tend to be willing to pay the price of neurotic suffering in the hope of regaining paradise lost. This subtle form of resistance must be analyzed. If these pitfalls are avoided, the innovations provide us with additional ways of reaching those infantile instinctual forces that patients so assiduously ward off. A quite different modern approach is that of social and community psychiatry, which attempts to bring help into areas that have long been neglected. Hospital patients are now being reached en masse as they have never been before. However, before we hurry hospital patients back into the community we first must prepare them with adequate therapy. Group therapy is the keystone, and it is used successfully in an increasing number of hospitals. Once analytic group therapists are willing to adapt their basic principles to the needs of the patients, they should be able to make a significant contribution to this movement. Similarly, work with the disadvantaged is at last being provided by community psychiatry. Emergency treatment, storefront clinics, attempts to meet reality needs and build ego strength go a long way to relieve their condition. But only too often, emotional needs are not met because the all-important factor of sustained relationships are for one reason or another not offered. Analytic group psychotherapy could bridge the gap if the therapist came out of his protected situation and learned to adapt his method liberally to the situation. The future of analytic group therapy, therefore, is, in my opinion, open for tremendous expansion. Surely it will become progressively effective with that increasing number of middle-class neurotic and character problems who come to us for treatment and it will help to actualize more fully the creative and leadership potential of this half-forgotten sector. Once the flexibility of the method is recognized, it will contribute substantially to hospital and disadvantaged populations. “I have a dream,” too, that if we devoted our attention to applying certain of our techniques with the relatively healthy, we could bring about the improvement in communication that is so much needed in our society. All walks of life cry out for change in this area, from family life to international relations. This could be accomplished through broad-scope programs in the schools and by the simple technique of interpreting only the here and now in interpersonal relationships, avoiding any attempts to trace transferences to their point of origin. Analytic group psychotherapy could become the key for this whole wide range of programs. Hopefully there will always be competing innovations, too; for out of such conflict is progress effected. Ackerman, N. (1954), Some structural problems in the relations of psychoanalysis and group psychotherapy. Internat. J. Group Psychother. 4:4-131. Berne, E. (1960), Psychoanalytic versus dynamic group therapy. Internat. J. Group Psychother. 10:98-103. Durkin, H. (1964), The Group in Depth. New York: International Universities Press. Ezriel, H. (1950), A psychoanalytic approach to group treatment. Brit. J. Med. Psychol., 23:5974. Fenichel, O. (1941), Problems of Psychoanalytic Technique. New York: The Psychoanalytic Quarterly. —— (1945), The Psychoanalytic Theory of Neurosis. New York: Norton. Foulkes, S. (1964), Therapeutic Group Analysis. New York: International Universities Press, 1965. Freud, A. (1936), The Ego and the Mechanisms of Defense. New York: International Universities Press, rev. ed. 1966. Freud, S. (1914), Remembering, repeating and working-through (Further recommendations on the technique of psychoanalysis, II). Standard Edition. 12: 145-156. London: Hogarth Press, 1958. —— (1921), Group psychology and the analysis of the ego. Standard Edition. 18:67-143. London: Hogarth Press, 1955. Fried, E. (1954), Effect of combined therapy on the productivity of patients. Internat. J. Group Psychother., 4:42-55. Glatzer, H. (1962), Handling narcissistic problems in group psychotherapy. Internat. J. Group Psychother., 12:438-455. Greenson, R. (1967), The Technique and Practice of Psychoanalysis. New York: International Universities Press. Kubie, L. (1958), Some theoretical concepts underlying the relationship between individual and group psychotherapies. Internat. J. Group Psychother., 8:3-19. Rangell, L. (1954), Psychoanalysis and dynamic psychotherapy. J. Amer. Psychoana!. Assn., 2:152-166. Sager, C. (1960), Concurrent individual and group psychotherapy. Amer. J. Orthopsychiat., 33:225-241. —— (1964), Interaction and insight in combined therapy. Symposium. Internat. J. Group Psychother., 14:403-412. Schwartz, E. and Wolf, A. (1962), The Psychoanalysis of Groups. New York: Grune & Stratton. Spanjaard, J. (1959), Transference neurosis and psychoanalytic group psychotherapy. Internat. J. Group Psychother., 9:31-42.